No need to stress over water quality or clarity issues when you use our comprehensive line of easy-to-use water treatments and products for ponds, waterfalls, and fountains. Combining science with simplicity, Aquascape makes it easy to maintain a healthy, well-balanced water feature. Aquascape Water Treatments make dosing simple and affordable. 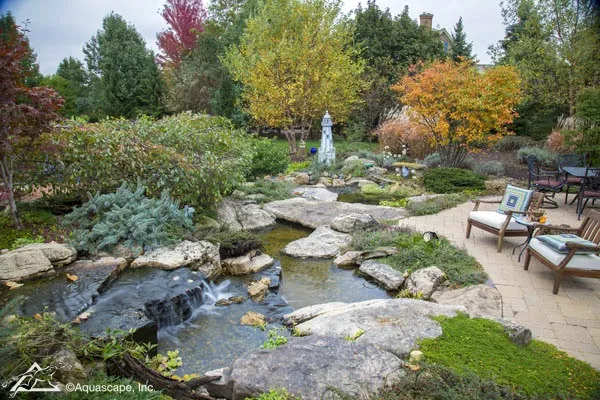 Put away your calculator and enjoy a clean, clear, and healthy ecosystem pond, Pondless® Waterfall, or decorative fountain with the complete line of Aquascape water treatment products. Select the category below that best describes the issue you’re having with your water feature. You’ll find Aquascape has the best solution to naturally and efficiently balance your pond, or waterfall. Aquascape Simple Solutions water treatments are the easy way to keep water features clean, clear, and healthy. Maintain your water feature by tackling most water quality and clarity issues with our line of easy-to-use water treatments and products. Two application options are available with our Simple Solutions product line. You can choose to dispense the treatments automatically using the revolutionary Automatic Dosing System, or you can apply them manually with our easy-to-use pump-top bottles. The electronic Automatic Dosing System (ADS) features a sturdy housing unit with an easy-to-use control panel that holds water treatment pouches and consistently dispenses the treatment into the water. Adjust the level of treatment based on the number of gallons of water in your feature to ensure proper dosage. The unit is extremely quiet, dependable, maintains optimal water quality, and best of all – does the work for you! Four pond water treatment options are available to use with the Automatic Dosing System. They cover everything from adding beneficial bacteria, to protecting your fish against disease. Each treatment is available in a handy pouch and serves a specific purpose. All pond water treatments are safe for fish and plants. Two water treatment options are available for use with fountains and waterfalls (no pond). Also available in a convenient pouch for use with the Automatic Dosing System, the treatments keep your water feature clean and beautiful. All of the Simple Solutions pouch water treatments for the Automatic Dosing System are available for dispensing from a pump-top bottle. Simple Solutions Pump-top bottle water treatments come in 8 ounce, 16 ounce, and 32 ounce sizes. In addition, a one-gallon container is available for refilling the pouches or pump-top bottles. Combines our most effective pond water treatments into one powerful formulation to successfully keep ponds clean, clear, healthy, and maintenance-free. This is the main treatment for your pond and the one you’ll keep in your Automatic Dosing System, unless a problem arises. Quickly optimizes the quality and clarity of pond water while drastically reducing filter maintenance. Clean for Ponds uses a powerful blend of heterotrophic bacteria to naturally digest organic waste or sludge caused by uneaten fish food, fish waste, and decomposing leaves and debris. Contains a concentrated formulation of ingredients designed to eliminate unsightly water conditions, solving even the most stubborn water quality problems. The specialized formulation contains a blend of clarifiers designed to clear cloudy or discolored water and reduce debris that attaches to rocks and gravel. Uses an all-natural formulation of tea tree oil and other plant-based biopolymers to effectively protect pond fish. The special formulation effectively reduces fish stress, prevents parasites and bacterial infections, and accelerates the healing of superficial wounds, scrapes, cuts, and breeding abrasions. Prevents unsightly fountain and waterfall conditions to keep water features looking clean and clear while reducing maintenance. The formulation also works to prevent stains, foam, white scale build-up, and other unsightly water conditions. Contains a fast-acting flocculent and phosphate binder to clump and clear suspended debris. The water in fountains and waterfalls is effectively cleaned and clarified to keep the features looking their best while significantly reducing maintenance and issues with water quality. Beneficial Bacteria supports your pond’s nitrogen cycle by effectively reducing fish waste, organic plant material, sludge, and excess nutrients. Effectively reduces fish waste, organic plant material, sludge, and excess nutrients in your pond. A faster-acting version of Beneficial Bacteria for Ponds (Dry), it effectively reduces fish waste, organic plant material, sludge, and excess nutrients in your pond. Effectively reduces fish waste, organic plant material, sludge, and excess nutrients in your pond for water temperatures of 50 degrees and below. Quickly establish the biological ecosystem for new ponds and spring start-ups, helping to support the nitrogen cycle and provide clean and healthy water conditions. Provides clean, clear, and healthy water conditions by effectively reducing waste and promoting a balanced ecosystem. The tabs can be cut in half to use in container water gardens. Our line of problem-solving products allows you to select the correct water treatment application for your particular need, from clearing debris to cooling pond water and more. Clears cloudy or discolored water by clumping suspended debris. The powerful combination of strong natural cleaners breaks down organic debris and maintains a biological balance in your feature while the phosphate binder prevents water quality issues. Helps control organic waste and debris and rapidly resolves pond problems, including cloudy water. Easy one-dose container. A concentrated formula with added enzymes provides a natural method of clarifying pond water by working instantly to break down sludge and clean filter pads. Convenient pellets with a concentrated formula and added enzymes provides a long-term, natural method of clarifying pond water by working instantly to break down sludge and clean filter pads. Safely dyes pond water a shimmering black color, providing shade, filtering sunlight, cooling water temperature, and helping to hide fish from predators. Safely dyes pond water an attractive blue color, providing shade, filtering sunlight, cooling water temperature, and helping to hide fish from predators. Eliminate string algae or green water quickly and effectively with our popular algae treatments. Eliminates unsightly algae and debris from waterfalls, fountains, streams, and rocks on contact. Controls string algae, clears green water, and stops algae growth in ponds, waterfalls, and fountains. Balance your water in an eco-friendly way with water treatments designed to efficiently combat water quality issues, leaving your pond healthy and beautiful. Makes pond water safe for fish and plants by eliminating harmful toxins. Neutralizes large concentrations of toxic ammonia. Increases overall KH/pH and alkalinity. Successfully removes discoloration and odors in pond water. Eliminates foam from pond and near waterfalls. Eliminate and prevent unsightly pond sludge with our easy-to-use sludge fighting water treatments. Eliminates pond sludge on rocks, gravel, and filtration. The easy-to-use water soluble packs dose the sludge directly and make it easy to spot-treat. Biological pond and filter cleaner effectively reduces fish waste and decaying organic plant material in ponds. Enjoy a beautiful fountain year-round with our convenient line of water treatments specifically designed for a variety of fountains. Removes debris from fountains, waterfalls, and streams. optimized specifically for larger bodies of water and can cause issues when used in smaller water features. Restores the ecosystem in lakes and large ponds, keeping water clean, clear, and healthy. Eliminates organic sludge or muck from lakes and large ponds, enhancing water clarity and quality while removing odors. Safely dyes water an attractive blue color to shade and protect lakes and large ponds. Quickly binds large amounts of phosphate which otherwise cause issues with water quality and clarity in lakes and large ponds. Adds oxygen and elements directly to lakes and large ponds, turbo-boosting the effects of water treatments. Quickly clears stubborn clouding water caused by suspended particles in lakes and large ponds.